Capodimonte Shoe / Boot - Antique China Pottery Mark Query:- I have in my possession a porcelain booty marked with N and five crowns. This is the pottery mark of the Capo Di Monte factory of Italy, I believe. Please could you tell me a little more about this pottery mark and this item? It's hard to make any comment without seeing photos of the actual piece, rather than just the mark (bearing in mind I am no expert on historic Capo di Monte). After acquiring the Capo-di-Monte molds in 1821 the Marchese Ginori marked his pieces with a five crown points and seven crown points, so the number of crown points is variable. Some say the date was 1834 when the Doccia Ginory factory of Florence was known to have acquired the moulds (see my histories of Ginori and Capo di Monte by using the search box on the home page). 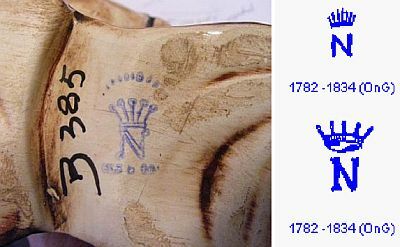 Porcelain boots are known to show the mark of the the Doccia factory of Florence (Ginori) similar stamped/printed five crown points pottery mark to yours. I don't have enough specialist knowledge to tell you much more about your boot - you need expert appraisers or specialist collectors to go one stage further. I can't say often enough that after the 1800's Capo Di Monte became a name to denote a style of ceramics, not a specific factory, so virtually anyone can put a Capodemonte style pottery mark on a piece and call it "Capo de Monte" or Capo di Monte" or "Capodimonte" or any other variation of the name and the pottery mark. This is why Capo di Monte is such a minefield for collectors who really need to know their stuff. Please send photos of your boot for reference.